Making homemade pizza allows you complete control of ingredients that will go on the pie. In this recipe, the inspiration is a handful of online sources that use hummus as the sauce instead of tomato-based pizza sauce. It's also vegetarian, but I could see others adding bacon bits, eggs, chicken slices, or similar toppings to their taste. The crust is also homemade from Annie's Eats and yields 2 medium-sized pizzas. To bake, preheat the oven and pizza stone to 500° F for at least 30 minutes. Transfer the dough to your shaping surface, lightly sprinkled with cornmeal. Shape the dough with lightly floured hands. Brush the outer edge lightly with olive oil. Top as desired. Bake until the crust is golden brown, and cheese is bubbling, 8-12 minutes. When the crust is ready, spread garlic hummus evenly. Sprinkle 1/2 cup of mozzarella evenly the best you can. 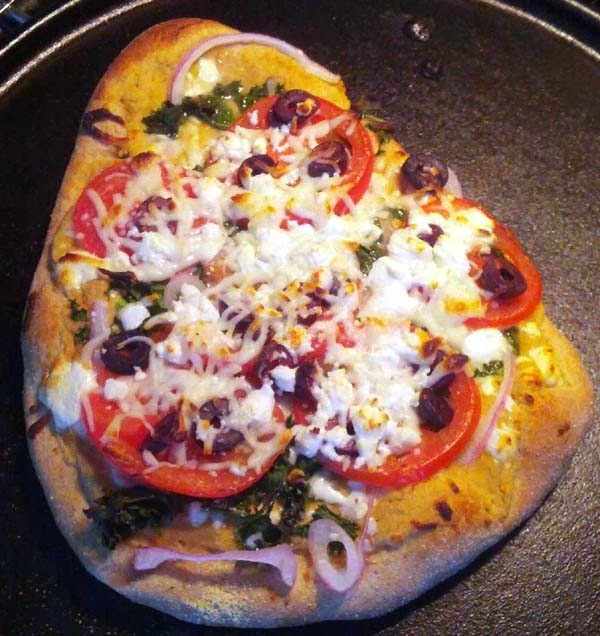 Spread out kale, onions, tomatoes, olives, and feta cheese. Finally, top it off with another layer of 1/2 cup mozzarella. Repeat steps for second pizza. Bake in preheated oven at 375 deg F for 10-12 minutes. Serve and enjoy.